* Only hand selected sable hair from cold weather males are used in a perfect blend with the highest quality European Ox ear hair. * The blend is in the perfect complementary ratio for both hairs to perform with outstanding holding capacity, snap, and shape retention. * Master Blenders are hand made with Raccoon hair from Northern Canada and have a resounding level of snap, yet the unparalleled plush, soft tip makes it the ultimate blending tool. * Our best white interlocked bristle comes from the coldest regions of Northern China and is equal to or surpasses the best interlocked bristle found anywhere in the world. 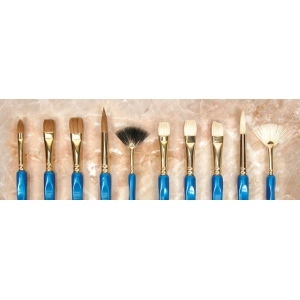 * The Museum Blue Topaz Best White Bristle Brush offers a bold and hardy strength for artists who rely on the unique qualities of white bristle for their creative techniques.